There were some interesting similarities between CAROL and BROOKLYN: set in the same era, both concerned naive young women that were shop girls. But CAROL is mostly composed of darkness whereas BROOKLYN dwelt mostly in the light. Therese (Mara) is a newly hired temporary employee (and budding photographer) at an upscale Manhattan department store. 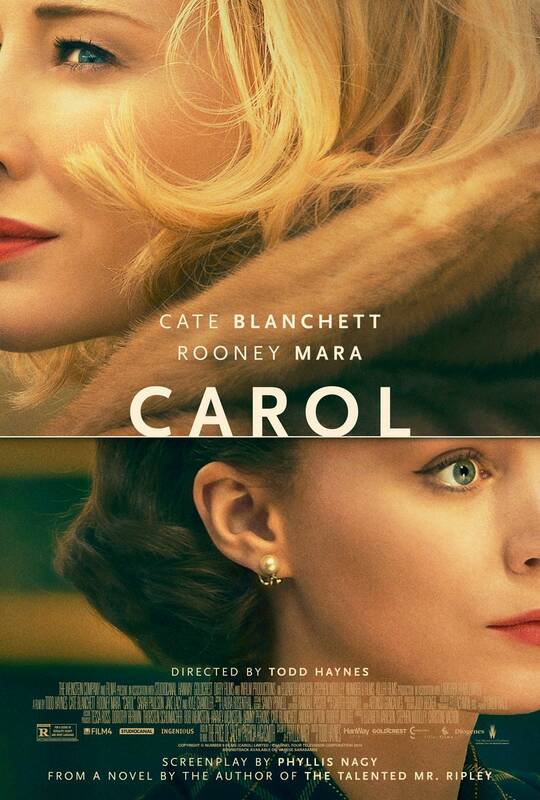 It is Christmas and she quickly meets Carol, (Blanchett) an elegant wealthy woman looking for a toy for her daughter. The attraction is immediate and soon they have embarked on a friendship. Carol is in the process of divorcing her husband (Chandler) and he uses her new relationship (not sexual yet) to threaten her with the loss of custody of her daughter. With nothing to lose, the two embark on a cross-country trip but their happiness at being together is short-lived as fifties morality bears down on them. This is a beautifully filmed and acted movie. The music is gorgeous too. Can a movie be both big and small at the same time? I think this one is. Highly recommended.